Over the years I’ve amassed quite the essentials oils collection. But I’ve never really figured out how to use them on the road without having to lug around a bunch of small bottles. That is until recently, when I spotted some essential oil towelettes at the store and it hit me—genius! These DIY towelettes live up to the hype. 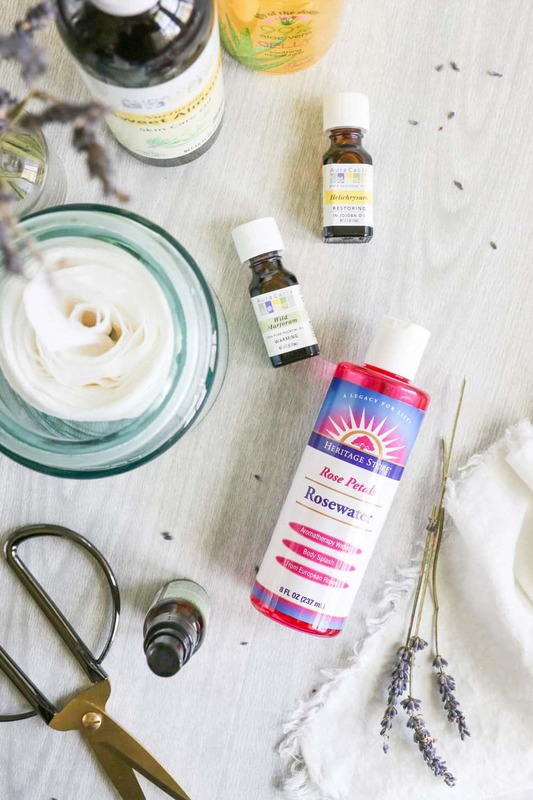 They use high quality essential oils and offer a variety of beauty-boosting and skin-soothing benefits on the go. Simply pull one out to swipe on everything from sunburn to tense muscles. These babies are the perfect way to reap the benefits of essential oils at the beach, while hiking, on car trips, or whenever you might need a little aromatherapy action. 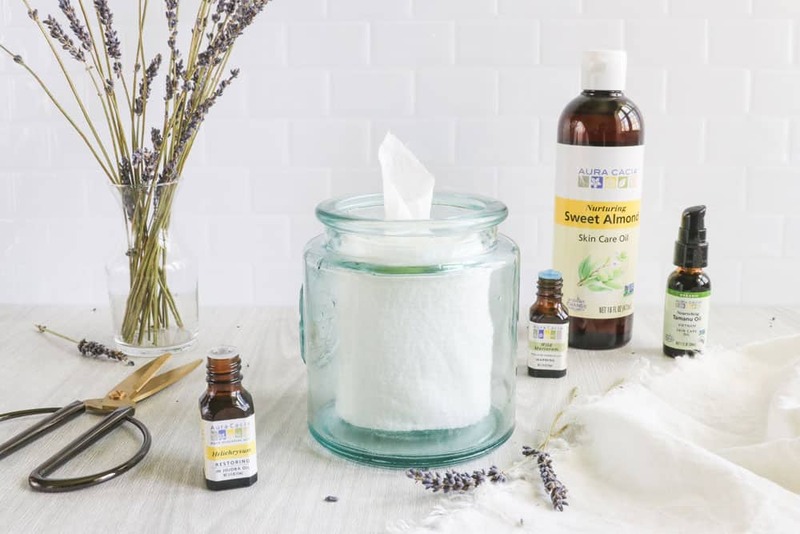 Plus, you can tailor them for pretty anything simply by mixing up your essential oils. 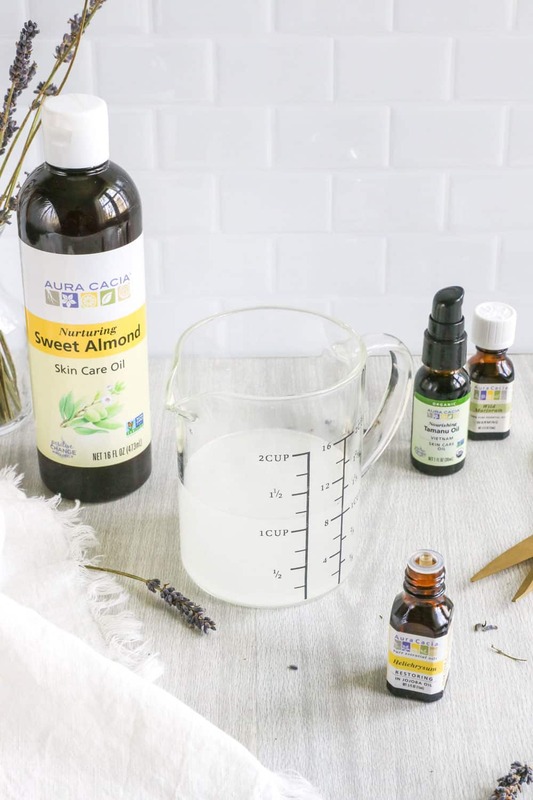 I used a variety of skin-soothing oils from Aura Cacia, like geranium, copaiba, lavender and ylang ylang that have a history of calming irritation, soothing the itch, and taking the sting out of sunburn or muscle aches. I also added some great carrier oils like Tamanu and Sweet Almond to nourish dry skin. Rose water gives them an amazing scent (especially when combined with essential oils). And aloe vera gel acts as an emulsifier to keep the oils and water together and provide skin-nourishing benefits to boot. It’s no secret that essential oils can be expensive. So when I find an oils company that values quality and sustainability, and doesn’t markup their products astronomically, I stick with them. I have been using Aura Cacia essential oils for years because they are one of the only companies that strikes a balance between affordability and responsibility. Aura Cacia is part of Frontier Co-op, a member-owned cooperative that gives back 4% of profits to people and the planet. They care for their small grower communities, openly share product information and give back to those in need. Plus, they take quality and purity seriously and test each and every one of their oil shipments before it hits the shelves. How many other essential oil companies can say all that? And it’s no secret that I love (love) iHerb, so when ordering my Aura Cacia oils I always stop there first. iHerb carries over 30,000 natural products and ships to over 150 countries. All orders are shipped from climate-controlled distribution centers to ensure the quality of their products. And if anything goes wrong, their customer service is top-notch. You can call in 24 hours a day, 7 days a week, and speak to an agent in as many as 10 different languages, if needed. But in all honesty, it’s their prices and incredibly fast shipping that keep me coming back. Their prices are as low as most wholesalers. Plus they often offer flash deals (like 10% off skin products or 15% off a particular brand) and bulk discounts on some items, so you can stock up and save. Not to mention they give you a 10% loyalty credit on every order that you can apply to your next order. And if you order over a certain amount, expedited shipping is 100% free. When combined, I’ve often found that their prices are so much lower than the competitors that it doesn’t make sense to order anywhere else. If you’re ready to shop for Aura Cacia oils, head on over to iHerb and browse their huge selection. While you can use whichever oils you like, here are some of the best oils for skin and why I love them. One of the lesser known essential oils, I always keep a bottle of Aura Cacia Helichrysum oil in my medicine cabinet to soothe cuts and scrapes. It’s also antimicrobial and antifungal so it’s perfect for sanitizing dirty hands when you’re away from home. Geranium is often used as a comforting oil to help take the sting out of aches and pains. I use it after a bit too much sun exposure to soothe redness and inflammation. Aura Cacia Geranium Oil smells amazing and doesn’t feel greasy like some other brands I have tried. Copaiba essential oil is said to help soothe minor muscle and joint paint, so I love applying it after strenuous activity or a workout. Ylang ylang oil has anti-inflammatory properties and antiseptic properties. It’s also smells amazing. Aura Cacia is one of the only brands where you can find 100% pure ylang ylang for such a good price. In aromatherapy, wild marjoram essential oil is invigorating, purifying and uplifting. But when it comes to skin health, marjoram is a warming oil that helps encourage blood flow and cell regeneration. Clary sage has a long-time favorite of mine for its balancing and restorative properties. It also helps tone the skin, balance the emotions and lift the spirit. Macadamia, Tamanu and Almond oils aren’t technically essential oils. Instead they’re classified as carrier oils, which help replenish moisture and keep skin feel soft and supple. Plus Lily of the Desert 99% Aloe Vera Gelly and Heritage Store Rosewater add extra skin-soothing benefits and give your towelettes an amazing scent. I store my towelettes in a glass jar in the fridge. But if you’d prefer to use these on the go, you can flatten the roll and place it in either a plastic bag or a food-safe storage bag (or even an old baby wipes dispenser). Then stash ’em in your purse or travel bag. If you have a small family or you can’t see yourself using these up quickly, it’s best to make them in small batches. You could also incorporate antimicrobial oils like tea tree and oregano to keep them fresh longer. But to be safe, I suggest storing them in the refrigerator and using within a couple of weeks. 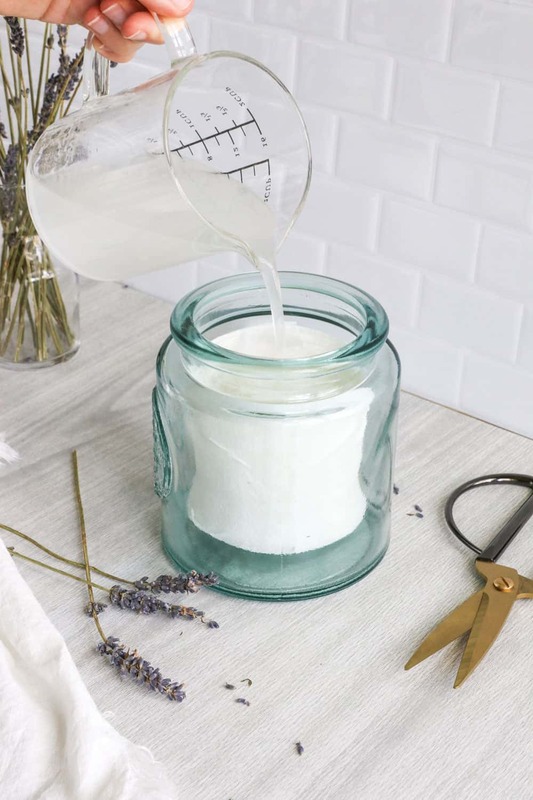 Unroll several sheets of paper towels and cut them into long strips the same height as your jar. Loosely roll the strips into one short, fat bundle (much like a roll of toilet paper). Just make sure the roll is still small enough to fit through the mouth of your jar. Gently pull the center most paper towel edge free and place the whole bundle inside the jar. Combine the rose water, essential oils, and all of the remaining wet ingredients in a small bowl. Whisk well to combine. Slowly pour the solution over the paper towels, allowing the paper to soak up as much of the solution as possible. You want the paper towels to be damp but not dripping wet, so pour out any excess solution pooling at the bottom of the jar. 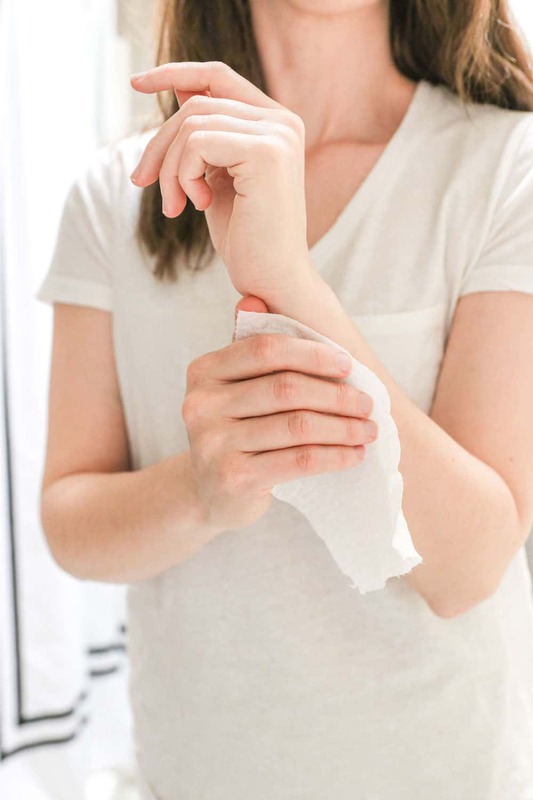 To use, tear off a paper towel from the center of the roll and rub directly on skin. Store remaining towelettes in the refrigerator for up to 2 weeks.